Mabel only remembered it was “crazy hair day” at school about forty minutes before she had to leave this morning and thought she’d have to skip it (because she thinks of forty minutes as very little time to get ready) but when Dean got the idea to do her hair like a birds’ nest, we all worked together to make it happen. 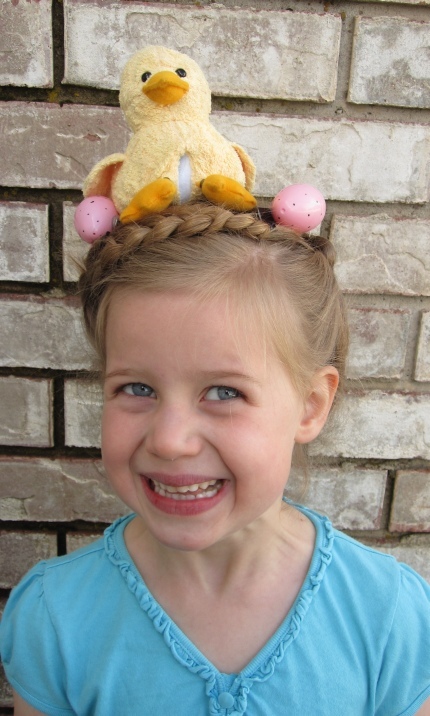 I did the braids while Dean glued Easter eggs onto hair clips. Dean even painted white speckles on Mabel’s blue eggs. Mabel’s used to Dean getting carried away and losing track of time, and she also has a great dread of being late for school, so when she heard he was painting the eggs, she said, “I knew this would happen.” But he finished making the clips by the time I’d finished doing her hair, and she was on time to school. The kindergartners don’t do crazy hair day with the rest of the school, so Rose was feeling pretty self-conscious when I dropped her off, but her friend and I reassured her that her hair was super-fabulous even if none of the other kindergartners were lucky enough to have theirs done. 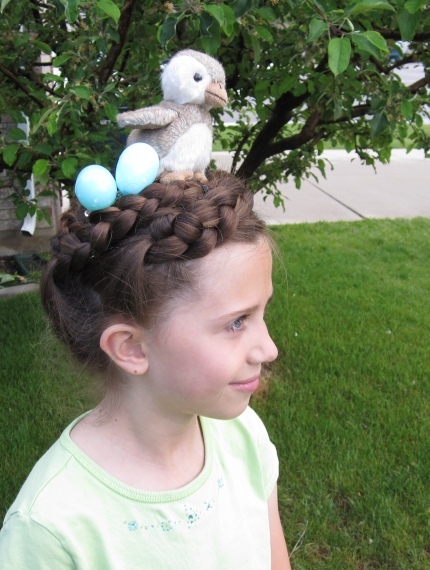 If we ever do this again (and why shouldn’t we, now that we have egg hair clips?) I’d want to dig out our realistic bird Christmas ornaments, and I might try leaving some of the girls’ hair hanging down and only use the top hair for the nests. This entry was posted in But Dean is the funniest, Creative miscellany, My kids actually are funny (and sweet and wonderful). Bookmark the permalink. I LOVE this! How fun! They were probably the most unique in the school. Oh. My. Gosh. Y’all are amazing. That is awesome! Love it. So fun that Dad got involved too. This is really cool! And what beautiful, beautiful, thick braids. Your girls have great hair! The great thing about this “crazy hair” style is that they managed crazy hair while still lokikng gorgeous. That is the best crazy-hair-day hair ever! I wish workplaces had crazy hair day. I would totally copy this. I hate crazy hair day, crazy sock day, weird tie day, et al. It drives me bonkers. 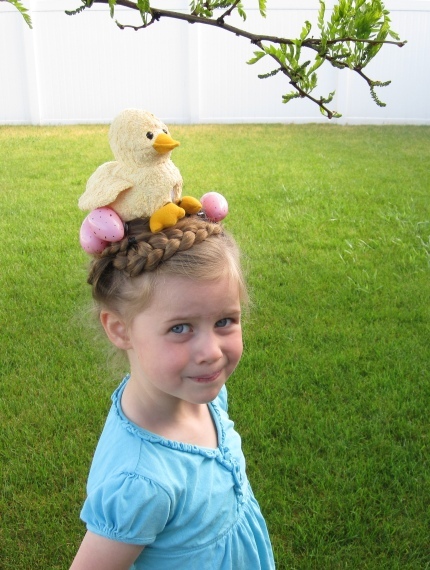 that’s the best up-do i’ve ever seen! We are stealing this idea next year – fab.u.lous! You just won a lot of mom of the year awards in my personal books of awards. You. win. I predict this will go viral and Family Fun magazine copies you in the future. 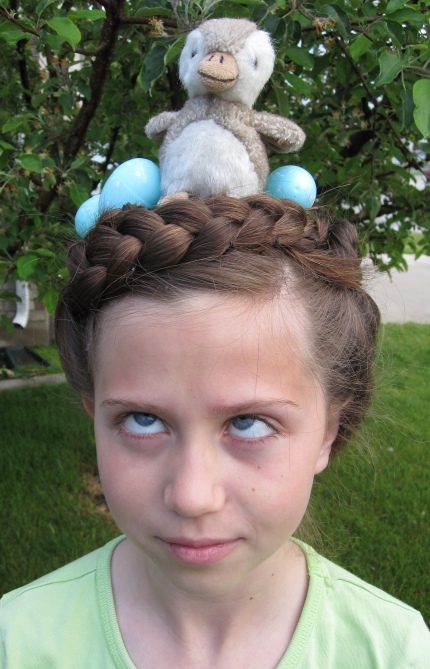 I wish I could do this with my hair, seriously. I saw some very cute birdies at the dollar store recently and was wishing I had a reason to buy them. A-MAZING! Seriously, I love this idea and I love that Dean got so involved with it. This is so completely awesome.